Japan put on another class performance to beat South Korea in Week 3 of the HSCB Asia 5 Nations championship last weekend. Meanwhile, Hong Kong’s impressive 45-point second half overcame a lively Filipino team, but it was anything but plain sailing. Another powerful performance by Japan at home in Tokyo against Korea (64-7) gave them three wins in a row to top the table with 18 points – and with a match against United Arab Emirates next week, it looks like it is going to be another clean sweep for the Japan team. Hong Kong’s head coach Leigh Jones remarked that they faced a difficult match before the game at Rizal Stadium in Manila on Saturday May 4. “The Philippines were in Japan’s faces for the first 20 to 25 minutes and we can expect a torrid time,” Jones told reporters before the game in Manila. “We will have to keep our shape and composure in the opening minutes if we are to come out winners,” he said. His prediction was spot on. Philippines threw everything they had at Hong Kong and were very successful. They were very fast in the tackle and made many swift, powerful forages into Hong Kong territory. They forced a kickable penalty just two minutes into the match and Philippines No. 10 Alexander Aronson gratefully accepted the three points. Hong Kong responded and were awarded a penalty try at the other end after 19 minutes, which Michael Glancy converted to take them into the lead at 3-7. But Philippines hit back almost immediately, with a converted try of their own to take the score to 10-7. Philippines made many attacking moves over the next 15 minutes and always looked dangerous, but Hong Kong somehow held them out. Hong Kong were awarded another penalty try six minutes from the interval, which was again converted by Glancy to make it 10-14. Almost immediately in the second half, Philippines again forced a penalty, which was kicked by Aronson to close the gap to one point. 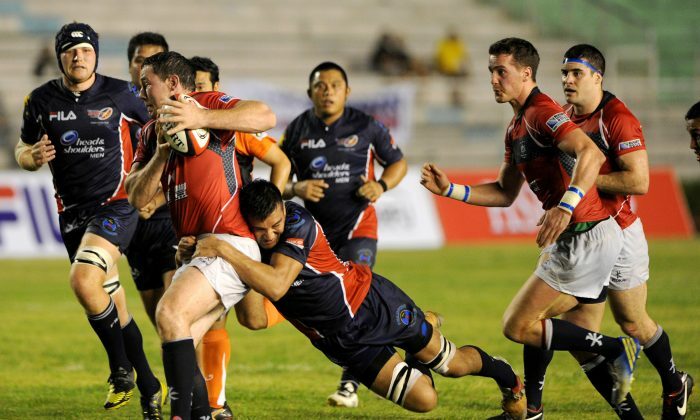 The turning point of the match came seven minutes into the second half: Dave Whiteford broke free and passed the ball to Jonny Rees to score under the posts, which was again converted by Glancy to give Hong Kong an 8-point gap. From this point, the heavier Hong Kong pack made their weight count and powered their way forward, forcing Philippines backward in mauls and scrums, making lots of ground in the process. Ally MacClay was the next to break free and, playing a one-two, allowed Rees to check in his second try of the match, again between the posts. Glancy was pleased to accept the additional two points to make it 13-28 after only 12 minutes of second-half play. Just two minutes later, real muscle by Hong Kong up front completed a push over try scored by No. 8 Pale Tauti to widen the gap. Glancy again accepted a conversion from between the posts to make it 13-35. Ex-Melrose Club player David Whiteford was next to score in the 64th minute; this time near the sideline, which was converted this time by Niall Rowark, who until now had been on the bench (13-42). A good run by Matthew Lamming produced another try, again a tester from the sideline for Rowark, but this time it slipped the wrong side of the upright. It was then time for Philippines to score a consolation try with a good run by their captain Mike Letts, which was converted by Aronson to pull the score back to 20-47. But with just four minutes left of the match Hong Kong scored again through Sebastian Alfonsi, which was converted by Rowark to push the score to 20-54. A final push by No. 23 Denis Chang made the final score 20-59. Hong Kong take a well earned rest next week (Week 4) while United Arab Emirates (UAE) play Japan in Dubai and South Korea play Philippines in Ansan, South Korea. In the final matches in Week 5, Hong Kong have a tough match away to Korea, where they will be keen to revenge the loss inflicted by Korea last year in the same competition; and, Philippines play UAE in what is expected to be the relegation battle.